Birmingham City have rejected an approach to take over the club from former QPR chairman Gianni Paladini. 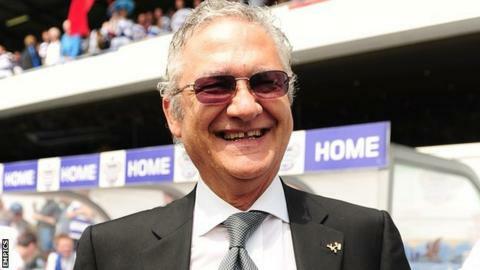 Paladini told BBC WM on Wednesday that he was involved in a consortium interested in buying Blues for £25m. But a statement released by the Championship club on Friday indicates that he has been turned down flat. "A takeover bid was made to the board's lawyers by representatives of an undisclosed party," read the statement. "But this was summarily rejected." It continued: "The board of Birmingham City FC can clarify its position following recent media speculation regarding the ownership of the club. "After comments made to the media, the club would like to place on record that there are no discussions taking place with any group associated with Gianni Paladini. The Italian, who has had an affiliation with football in the Midlands since representing then Aston Villa boss John Gregory as his agent a decade ago, is still based locally in Solihull. Paladini said he has been in the Birmingham area since coming to England at the age of 22. He left QPR by mutual consent in 2011 after eight years at Loftus Road. Blues, 21st in the Championship, are currently owned by Hong Kong businessman Carson Yeung.